PCA | In the Key of "H"
Back to the blog. Not necessarily “Back in Black” like AC/DC, but just, well, back to the bog. It’s been the longest drought of my blogging activity since I started it. Much like I thought it would, the world continued to spend, Jesus’ church continued to move forward, and God’s will still came to Earth as it is in heaven. But I’m back now, at least for a bit, partly because of brain constipation (I get uncomfortable holding in ideas and thoughts which could be helpful to others to think about, agree with, disagree with, or wrestle with) and partly because I’m often encouraged by what I read on other blogs. I don’t follow the angry, divisive guys. And there’s a bunch of other “partly’s” of why I blog that I need not go into now. After vacationing in FL, I had the opportunity to go to General Assembly in Louisville, KY. If you are unfamiliar with it, its simply our denominational gathering. It is different than the Southern Baptist Convention, in that it’s Presbyterian. That sounds like one of those “duh” statements, but it’s really not. At least I don’t think. Presbyterians are different in their form of church government in that we don’t believe in the autonomy of the local church. We are are both representational (its leaders are elected from among the congregation and not appointed) as well as connectional to other P.C.A. churches. Now our connectionalism is voluntary and the local church can at any time pull out of the presbytery if it believes the presbytery has seriously erred. But the relationship is one of accountability. At Redeemer, if Barret or I, or our session are acting like yahoo’s, our presbytery can/should intervene, when folks in the local church ask for them to get involved. At the General Assembly level, it is not simply a gathering or reunion (thought that’s clearly my favorite part of it), but the actions taken at the denominational level are not simply suggestive. Therefore such meetings at presbytery and G.A. level are as important, as they are-often times-boring. One lad, summarized what went on at the G.A. level here. I don’t necessarily share all of his opinions, but for the most part, he does at least share what happened, should you at all care. Since he has already reproduced what went on, I’ll just conclude with one final thought on my experience at GA.
You can pretty much put people into certain camps based upon how they look and dress. Generally. You have the folks in suits, folks like myself in flip-flops, folks in sear suckers, pretty boys, old school guys with no fashion sense, some hipsters, etc…You can’t judge a book by its cover all the time, but you can often figure out which way they’ll vote simply by looking at the dress of such people in these meetings. I was glad to see at least some diversity. I was encouraged to see many people like myself. At times I was discouraged by seeing some crotchedy folks, and having to sit next to one who commented on my every vote (though mainly in jest). But in the end, the P.C.A., it if it is going to grow in size, diversity, and effectiveness, all the while maintaining doctrinal purity, will probably need to draw on all its resources. As much as I’d like everyone to wear flip-flops (or at least loosen up some times on non-essentials and not fear ANY change), and vote my way, and think like I do, I realize that we probably all need each other more than we really think. As much as it pains me to admit it. Truth has to trump taste. I left GA hopeful. Hopeful that the Holy Spirit hasn’t left the building yet, but instead is on the move. Glad I landed denominationally-though not in a prideful sort of way-where I landed. The P.C.A.’s annual meeting, General Assembly, which includes ruling elders and pastors from churches all across America, just finished up in Nashville this week. The scriptural basis for this gathering is found in Acts 15, where elders and apostles gathered to deal with some serious issues in the early church. I’m not a denominational “homer” who thinks his denomination is without flaws. I think we’ve got plenty of yahoos. But we also have Tim Keller, fortunately. So at times, those in my denomination drive me up the wall, and at other times there are those who make me thankful just to be a part of it. Believe it or not, despite the incredibly strict ordination process, pastors and churches vary quite differently on issues relating to music, schooling, culture, parenting, preaching, women’s roles, etc. Some can be crotchedy and likes-to-fight guy. 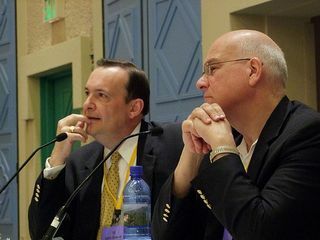 But our more prominent leaders, like Tim Keller and Ligon Duncan pictured above, regularly enter into gracious dialog over their differences. This really says a lot. And if I were to go to another General Assembly (I’ve only been to one because it was just a few hours from my house), I would find myself in the company of lads I love and respect, and lads I might have a hard time loving and an even harder time respecting. I try to steer clear as much as possible in saying I’m right and others are wrong when it comes to denominations. When I was being examined for this presbytery, I told them I wanted to responsible with my creation views. One lad wanted me to say “right.” But in a rare moment of wisdom, I reminded them that only one view will actually be right (sadly I was the only one there who thought the “responsible” way!) and we won’t find out until Jesus returns or we go be with him. So I’m content to settle with responsible. The same is true with denominations. I want to be responsible with the scriptures we’ve been given, with the church history we’ve been given, and with the Holy Spirit given to every believer. Don’t look for the right one, as though there is one right and many wrong. Instead look for the most responsible, but learn from other responsible ones. If you’re in an area that doesn’t have a PCA or a Baptist, or whatever you would prefer, seek out a scripturally responsible church, even if you can’t jive with everything it believes. To reiterate that this approach limits arrogance, let me posit this question. Shouldn’t any pastor of any denomination or denominational camp like “Reformed” “Baptistic,” “Charismatic,” etc…., consider where he is to be the most responsible place. If not, shouldn’t he go somewhere that is? There is nothing arrogant about seeking to be in the most scripturally faithful camp. Arrogance comes when you believe your camp is the RIGHT scriptural camp, and refuse to learn from other scripturally faithful denominations. That’s why I try to intentionally add variety to my reading. Anyhow, that’s my P.C.A. schpeel for now, and will probably not bring the topic up for another year!